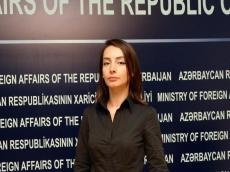 Armenian Prime Minister Nikol Pashinyan should understand that the settlement of the Armenia-Azerbaijan Nagorno-Karabakh conflict, first of all, will open up great economic opportunities for the population of Armenia, spokesperson for the Azerbaijani Foreign Ministry Leyla Abdullayeva told Trend Feb. 1. “First of all, I would like to remind that as a result of the conflict, namely Azerbaijan’s Nagorno-Karabakh region and seven adjacent districts were occupied, and about a million of Azerbaijan’s population was subjected to ethnic cleansing and became IDPs,” said Abdullayeva. She noted that international resolutions and documents adopted in connection with the conflict, first of all, the four UN Security Council resolutions require the complete, immediate and unconditional withdrawal of invading Armenian troops from the occupied Azerbaijani territories. “I would also like to say that all documents adopted in connection with the conflict’s settlement and the proposals of the OSCE Minsk Group co-chairs concern not the “people”, but the population of Armenian and Azerbaijani origin,” she noted. “In conclusion, I would like to note that Pashinyan, as a prime minister of Armenia, should understand that the settlement of the conflict will step up the independence of Armenia, and, first of all, will create a new situation that will open up great economic opportunities for the population of Armenia,” she added.